This is just in. 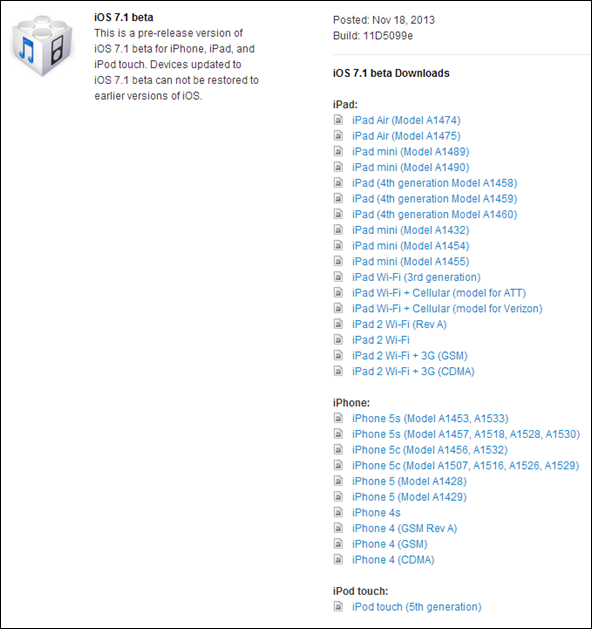 iOS 7.1 beta 1 download links have just gone live for iPhone 5, 5s, 5c, 4s, 4, iPod touch 5, and iPad 2 and up on the iOS Dev Center. A new beta for Apple TV 2nd and 3rd gen has also been released. Apple is usually extremely cagey when it comes to publishing a full and detailed change-log with beta versions of iOS. In terms of changes that actually affect the end-user there doesn’t seem to be a great deal of information being offered through the release documentation. Developers on the other hand have a plethora of changes and additions to get to grips with. An important fix surrounding HTTP requests has been bundled with this latest beta as well as a number of amendments within the CoreText framework that allow developers to integrate advanced text techniques into their third-party apps. One fix within this beta that could present a noticeable benefit to the end-user focuses on a bug that caused apps loading an iTunes Match library to take an extended period of time. Apple is hopeful that the bug has been eradicated along with improvements to multipeer connectivity and enhancements to the UIKit framework that allows developers to make use of standard user-interface components that are common through most apps. As with most beta launches, Apple has specified a number of known issues. There continues to be some issues occurring with 32-bit apps running on new 64-bit hardware, namely the iPhone 5s and the new iPad Air along with the iPad mini 2 with Retina display. Apple is also aware of a number of issues surrounding Bluetooth connectivity within this beta. iOS 7.1 beta 1 firmware pushed out to developers today follows hot on the heels of the public release of iOS 7.0.4 that brought with it a number of optimizations, stability improvements and important security fixes. 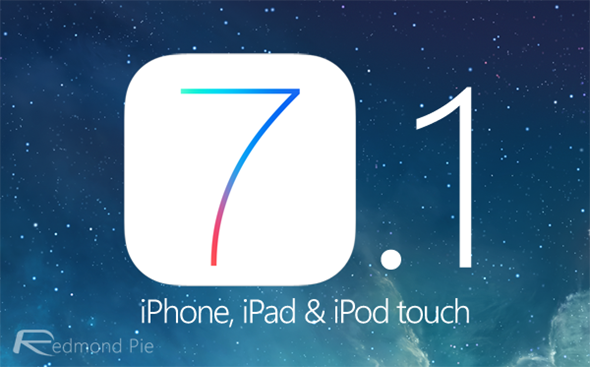 You can find iOS 7.0.4 download links here. To download iOS 7.1 beta 1, you will need to be a registered member of iOS Dev Center. If you are already a member of Dev Center, you can head over to iOS Dev Center now at developer.apple.com/devcenter/ios/ to start downloading iOS 7.1 beta 1.